KRISP has invested in two new Sanger DNA sequencers, including the ABI3730xl, which is the largest and most automated Sanger machine in the world. This equipment has 96 capillaries and it is able to produce over 1,500 sequences a day. KRISP has invested in two new Sanger sequencers, including the ABI3730xl, which is the largest and most automated Sanger machine in the world. This equipment has 96 capillaries and it is able to produce over 1,500 sequences a day! 'We are delighted to have purchased the largest Sanger sequencer available. 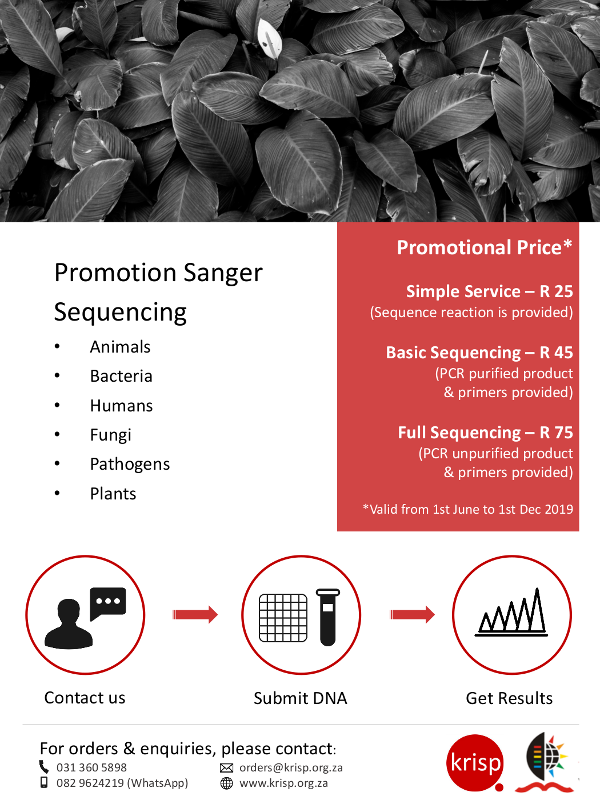 It now put us in the position to provide high-throughput and affordable DNA sequencing services'. We provide discount to clients that generate bulk orders in a year (i.e. > 1,000 samples per year) and Institutional discount to UKZN.